Single-use sensors offer functional parity with their fixed counterparts while also providing the benefits of being pre-sterilized and ready for use. Disposable sensors are less high-maintenance than fixed sensors considering that expensive and time-consuming hazard cleaning and sterilization operations do not need to be performed after use. Furthermore, many disposable sensors are compatible with continuous manufacturing processes; properly tested and manufactured sensors can reliably function for the full extent of their operation. They are typically pre-calibrated by sensor manufacturers beforehand in a tightly controlled evaluation process; thereby eliminating the need for CBP manufacturers to validate the sensors. Single-use sensors are made with materials that are simultaneously flexible, temperature-stable, and resistant to pressure. Common applications of these sensors in upstream processes include measurements of temperature, pH, pressure, and dissolved oxygen levels in bioreactors. Critical elements of manufacturing systems such as polypropylene connectors and silicone tubing are usually the weakest links in an assembly. However, disposable components in manufacturing systems have an edge over fixed elements in regards to sterilization; disposable connectors are designed to be well-validated and sterile without requiring any additional sterilization effort on the part of manufacturers. 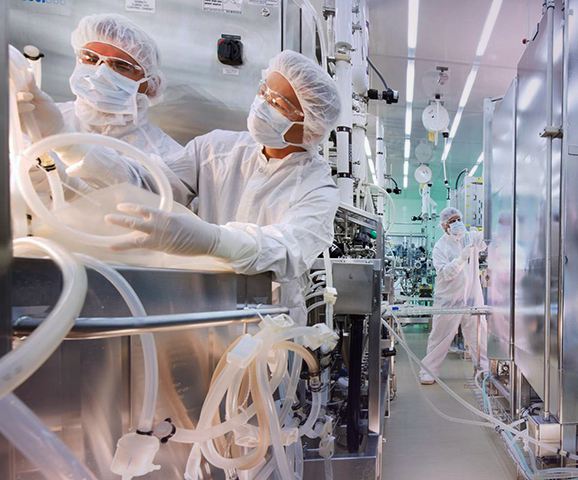 The growing demand for personalized medicine is pushing manufacturers to produce a greater variety of biologics more effectively and cheaply; sterile and reliable disposable connectors are helping to facilitate this trend. Material quality is of the utmost importance. Fluid path materials must not leach into the product nor attract unwanted biofilms. Connectors should be durable. Using provably durable connectors will ensure that these mission-critical components will not fail in taxing conditions. The connector itself should be well designed. Operator error is the primary cause of failure in biomanufacturing processes; connectors should be designed to prevent this. It should integrate well with other components in the manufacturing system. This consideration is especially relevant to CBP where new equipment and methodologies are still being developed. Single-use bioreactors offer several advantages over stainless-steel: they come with fewer sterilization concerns, leaks can be more easily identified, and production can proceed continuously without necessitating stops for cleaning and maintenance. Furthermore, leaks that do occur in single-use bioreactors are typically less injurious than if they occur in stainless-steel reactors. Single-use bioreactors are very well-suited, if not necessary, for CBP because they allow manufacturers to more consistently push out product without having to contend with the usual hindrances provided by fixed bioreactors. The productivity benefits that single-use components provide more than make up for the high per-unit costs, which are subsequently offset by reductions in time spent on traditional maintenance and sterilization procedures. Single-use systems are instrumental in the flourishing of CBP. SUS enables continuous production flow through the elimination of typical bottlenecks experienced by fixed, usually high-volume, batch production operations. The use of SUS is set to accelerate in the future as more companies transition to prioritizing a greater variety of therapies designed to treat a more extensive and more diverse assortment of conditions than ever previously acknowledged. CBP and SUS are well-suited for this burgeoning market focus.